I guess, I'm a little bit slow when it comes to completing my herb garden which I've planned to do decades ago (lol). Well, I've started with some but I haven't had the luxury of time to complete everything as of this time and I'm so looking forward to have this done as soon as possible. 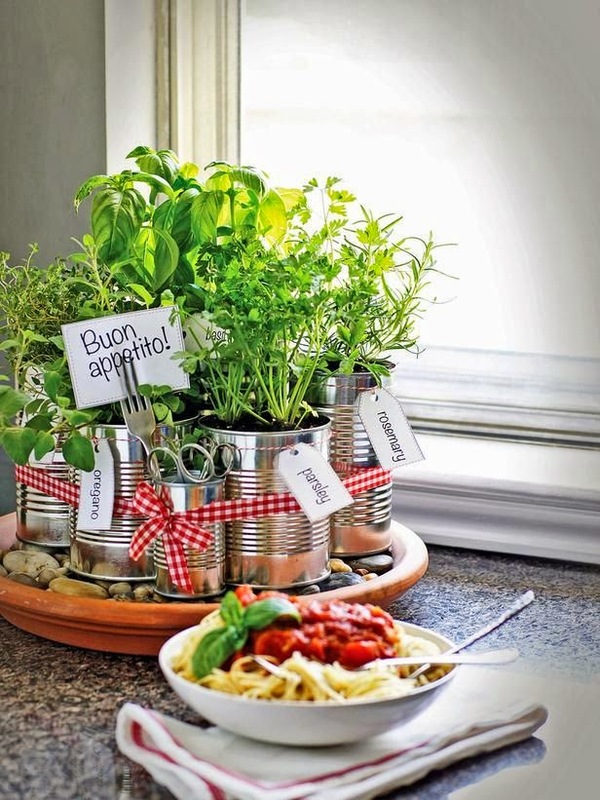 But one thing good about failing to do this at once is having the opportunity to look for more herb gardening ideas and recently, I've found this awesome idea of having an herb garden right on your dining table. I love that there is also a separate tin container for your small scissors in case you intend to cut some stalks for your salads or any dish that you're preparing in the kitchen. You see, this doesn't even require us to buy so many things. Empty tins were used for planting the herbs and adding some ribbons and a perfect underliner tray did the trick. That looks very clever, Teh Krizz! And it even made the dining table come alive! I love seeing those greens!